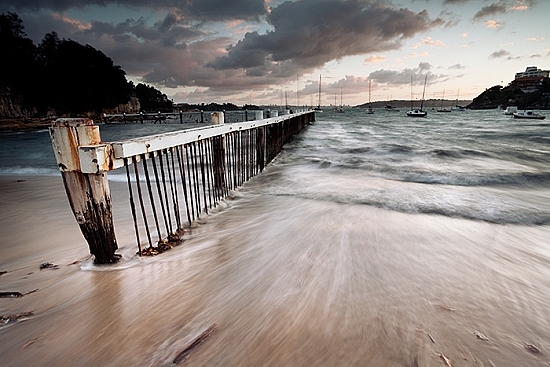 Manly is a popular tourist destination and as a result well photographed. Located on the North Shore of Sydney it has an extensive coastline with several beaches doted around and panoramic views back to toward the city from North Head National Park. On the walk from Manly Beach to Shelly beach (well worth a look) Cabbage Tree Bay also known as Fairy Bower is home to a stunning sea side rock pool. There are limited angles to shoot the pool with the majority favouring a landscape orientation shot taken from the northern side (closest to Manly). For me this leaves a hole in the middle of the image so I prefer the portrait shot. In the following image I took a step back to use the pools overflow as a leading line into the image toward the Oceanides statue at the head of the pool. As the pool is light at night by sodium lights I recommend avoiding early sunrise or late sunset due to the colour cast obviously present at these times. Post processing can of course fix this but can lead to unrealistic results. There are several lookouts dotted around North Head National Park with views back toward Sydney city, South to Hornby Lighthouse and the Eastern Suburbs and North along the coast. For me the most impressive of these can be found by following the scenic walk around to the Northern most look out for an inspirational vista along the coast. As North Head is some distance from the bright lights of Manly the East side is a good spot for some night photography. You can aim due East or North with little or no light pollution from the City or Manly. With a telephoto lens there is a great opportunity to capture Hornby lighthouse with the peaks of Sydney’s skyline as the backdrop on one of the southernmost lookouts. A great secluded location away from the lights of the city and Manly can be found near the sewer treatment plant on North Head. Care must be taken whilst photographing here as its on the cliffs edge with no fences. Its perfect for full moon shots or a spot of light painting, here I shot a 30 minute exposure for the sky and the pieced together the rest using various light sources. Check out my blog to see how I put this image together including the capture and processing. A lesser known beach in Manly, Little Manly Cove is a small beach facing South with many boats moored and a large park in close proximity. The remains of Little Manly swimming pool make for a good focal point. For other Manly shots that don’t necessarily constitute as ‘Special Photographic Features’ see my website all of which are marked on the map. There are of course many more shots in the surrounding area but I’ve left this for another guide. If there is anything you feeling I’ve left out contact me through my website and I’ll be sure to update it. Nothing special needed just the usual suspects: ND Grads, tripod, remote release, camera, shoes that can get wet. Full moon – North Head, back of Shelly Beach down by the water’s edge (see map). Cabbage Tree Bay is best shot at low tide, in the above shot this allowed me to frame the rocks in the bottom which would otherwise be under water. Other than that it depends on what you are shooting, you may want to come back at different tides to see which you prefer. Most spots around Manly can be shot safely without getting too wet. Up on North Head you may have issues with wind and the resulting camera shake. I suggest leaving this one for a less windy day. The back of Shelly Beach is accessible via a walking track down to the waters edge on the tip of the head land. You will need to climb over rocks and avoid incoming waves to get further around so this isn’t for everyone. Note: A security gate closes at 10pm (from memory) near the roundabout on North Head Scenic Drive but whenever I’ve been up there late it has been left open. If it is closed you will need to walk about 1.5km to the start of the Fairfax Walking Track (10 minutes return). very good guide Lee, thanks for opening up some possibilities!